Ai là kẻ tội phạm của xã hội: Nhà Nước hay là Người Tố Cáo Nhà Nước? Qua bài viết phía dưới, bà Sibel Edmonds đã xác định rõ rệt, đúng đắn và quá ư là cần thiết cho các quý vị đọc qua, biết đến mà rõ là chẳng hiểu gì hết hay hiểu sai Tía nó ý nghĩa đích thực của sự việc: rằng kẻ phạm tội chính là cái Nhà nước Mỹ xâm phạm quyền RIÊNG TƯ CÁ NHÂN chứ không phải là ông Edward Snowden, để mà phải đi kêu gọi viết Thỉnh nguyện thư ĐẾN CHÍNH CÁI BỌN TỘI PHẠM MÀ XIN KHOAN ĐỎ, KHOAN HỒNG GĨ GĨ GÌ CHO ÔNG EDWARD SNOWDEN – Ôi sự HIỂU BIẾT= cái DÂN TRÍ nó QUAN TRỌNG thì thôi. Someone had the gall to send me this pathetically misguided, ignorant, and demeaning petition requesting a Governmental Pardon for NSA whistleblower Edward Snowden. I say pathetic because I believe this was a genuine attempt to support this courageous whistleblower, but instead became an establishment-supporting, insulting and self-defeating petition due to the authors’-organizers’ ignorance. I say misguided because this is a case where the criminals who have violated our Constitution and laws are the ones who should be seeking forgiveness and pardon from the people. The executive branch is the party which has violated the Constitution and broken the supreme laws of this nation, thus in need of repentance and pardoning. Not the courageous whistleblower who took his oath to protect the United States Constitution seriously and actually exercised it. I say demeaning because it misrepresents and insults the guardians of the United States Constitution, and reduces these truth-telling whistleblowers to criminals-to those who have committed illegalities. Not only that, it simultaneously raises the status of a criminal government to those of kings and emperors who can do no wrong. When the kings engage in criminality they call it ‘the king’s given rights.’ When an irate minority dares to expose the kings’ criminality they are declared a criminal-to dare to challenge the kings. The insulting ignoramuses who drafted this pathetic petition are giving the president and the executive branch of the United States of America the status of absolute kings and emperors. Here we have a case where there is a president and his entourage who see themselves as the absolute and untouchable kings of the United States, and break with reckless abandon the supreme law of the United States, the Constitution. They do so repeatedly; with arrogance and impunity. 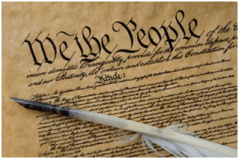 We have a case where a conscientious citizen of the United States does what his citizenship demands of him: he stands up and protects the Constitution of the United States by exposing the kings engaged in its violation and destruction. We have the United States Executive Branch which has suspended, violated and destructed the United States Constitution and its citizens’ rights. We have the United States Legislative and Judicial Branches which have abdicated their responsibilities under the United States Constitution, and instead of overseeing and holding accountable the President and his cabinet, who in this case have been violating and destroying the United States Constitution, they have been protecting and collaborating with them. And we have a true American, a citizen who has taken his US citizenship and citizen responsibilities that go with it very seriously-as demanded by the United States Constitution. He has courageously come forward to inform and warn his country of its rulers’ criminality. Now please tell me who should be seeking a pardon here? The conscientious citizen who is protecting the mother-of-all laws of his nation-the Constitution? Or the kings who have suspended, violated and broken the laws of this nation? Or the Judiciary and Legislative Branches who have abandoned their responsibility to the people of this nation and their oath to the Constitution? The authors-drafters of this ignorant and insulting petition have either totally mixed up their senses when it comes to crime and punishment. Or, they are among those who view the United States Executive Branch as kings and their powers as absolute, thus seeking a pardon for a citizen whose crime has been to expose the crime and responsible criminals-defending his nation’s laws and the people’s rights. I do solemnly swear (or affirm) that I will support and defend the Constitution of the United States against all enemies, foreign and domestic; that I will bear true faith and allegiance to the same; that I take this obligation freely, without any mental reservation or purpose of evasion; and that I will well and faithfully discharge the duties of the office on which I am about to enter. Once the drafters-authors of the shameful petition read and understand the basics of this nation’s Constitution, after they become enlightened, they may proceed to draft and circulate a petition where the executive branch is not treated as absolute king but as the servant of this nation, where the crime is violating the Constitution not protecting it, and where the criminals responsible for violating the Constitution are called to seek pardon from their masters-we the people of the United States. Next Next post: Tiên hành kỳ ngôn – Bổn Phận Trí Thức.